Welcome to the first in my series of entries I’m calling “Headset Hotties” which examines corporate culture’s fascination with headset-accessoried customer service representatives. 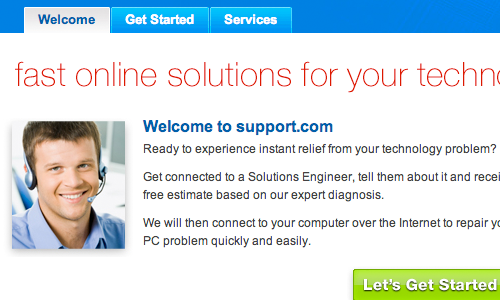 This one is a rare screen capture from support.com which features a headset-wearing man-hottie. One phrase stands out here, “experience instant relief,” which also seems vaguely sexual. I’m good, but thanks.